If you’re a pond owner getting ready for winter then you’ll more likely than not need a de-icer, especially if you have fish. De-icers (or heaters) are an effective way of making sure that your pond is able to release toxic gases. I’ve reviewed some of the best pond de-icers on the market and presented my findings here, alongside some general buying tips. 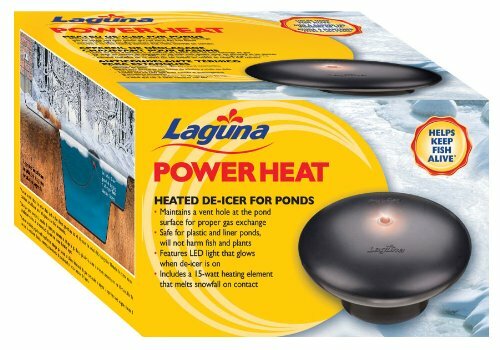 Click here to jump to our in-depth reviews of pond heaters & de-icers. 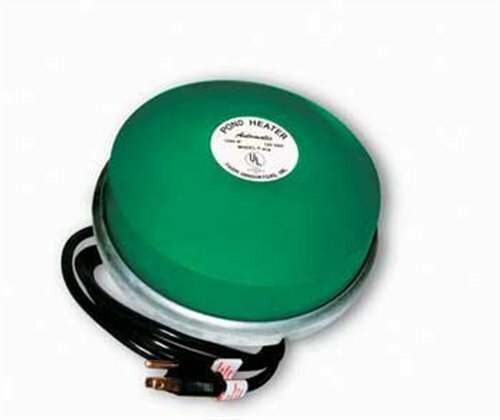 What is a pond heater ? In a nutshell, a pond heater stops a pond’s surface from being completely covered with ice. Generally speaking there are two types: floating and submersible. Submersible icers sit on the pond floor, issuing a stream of warm water which rises to the surface. A floating icers, as the name makes clear, floats on the surface of a pond, heating the water around it. The purpose of both is the same. By maintaining a small hole in the ice, oxygen is allowed in and poisonous gases, which can harm fish, are allowed out. The terms “heater” and “de-icer” are usually used interchangeably and refer to the same thing. The term “heater” is sometimes used in connection to larger, much more expensive units designed to heat whole ponds, often to care for exotic fish. Another term you may come across is “bucket de-icer“. These types of de-icers are for heating troughs and buckets from which animals drink. How do pond de-icers work? Pond de-icers usually include a heating element that is attached to some kind of floating device. The element extends into the pond and heats the water around it, which rises to the surface. This type of model often has a hole in the top. This way, in very severe cold weather, an opening directly above the heating element can still be maintained (see the picture). Alternatively,the heating element can be attached directly to the floating device. In this case water is heated around the circumference of the de-icer. Floating vs. submersible – Why would you want a submersible heater over a floating one? For those people with plastic ponds, it’s imperative to buy a floating unit. Placing a heating element next to a plastic lining can be dangerous. The benefits of submersible units are that they are more protected from the elements, particularly wind, which can quickly rob a de-icer of heat. Wattage – You need to make sure that the type of de-icer you buy is suitable for the size of your pond. Higher-wattage units are more suitable for bigger ponds. As an example, a zone 5 600 gallon pond will require a 750 watt unit. Smaller ponds will require a heater in the 200 – 300 watt range. Use this table as a rough guide. Thermostat – Nearly all modern heaters will be controlled by a thermostat, which turns the de-icer’s heating element on when the pond’s temperature declines towards the 0° mark. This unit from K&H is one of the best-quality heaters I’ve come across. It comes in three models – 250, 750 and 1500 watts. The 750-watt heater will work perfectly in even the coldest of temperatures. If you have a small pond, opt for a 250-watt model. Units with higher power work so well that they can actually break the dormancy of fish during winter. One of the main selling points is the fact that it is both a floating and a submersible de-icer. The floating mechanism can easily be removed if you’re in a particularly windy area. It comes with a 12-ft cord and a 2-year warranty. One of the key features of this de-icer is the LED light built into the top. This allows pond-owners to see when the unit is on, and so whether it’s working or not. It’s also quite nice to nip out into the garden on a winter’s evening to check if it’s happily chugging away. It’s good in any water that will see a drop of down to -20°F and consumes 315 watts, a good range for most normal garden ponds. The thermostat is also designed to shut off internal components to protect overheating. Uniquely, it comes with a small, energy-saving heating element built into its top, to prevent the buildup of snow. This heater/de-icer from Allied Precision is a very powerful unit that will keep entire ponds free of ice. It’s good, for instance, if you want to keep a water fountain running, or if animals will be drinking from a trough. 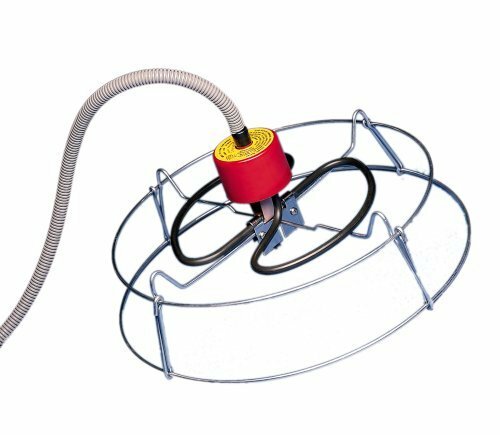 Although it’s submersible heater, it can be placed in plastic ponds or tanks. It is held in a metal frame that raises the heating element above the ground. Whilst the heating element itself is made from steel, and so rust-resistant, the frame itself is prone to rust so will need to be replaced. Allied Precision provide a stand-alone frame – the cynic in me suspects bad intentions – but it is inexpensive and the heater itself is top-notch. Remember, this is for smaller ponds and livestock troughs/buckets that you want completely free of ice. This 1250 watt unit is ideal for ensuring that even the coldest pond surface is adequately ventilated. The heating element, which is made from aluminium, is attached to a floating device and is powered by a ten foot cord. It’s suitable for ponds up to 600 gallons. It requires more power but also heats up the pond more quickly. 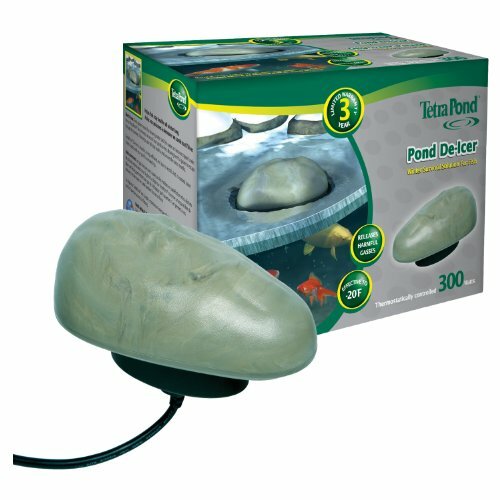 This unit is best for those with bigger ponds. As long as it’s properly looked after, and is removed from the pond and stored during the warmer months, then it should last for several seasons. 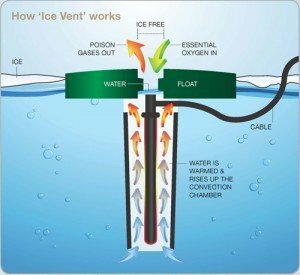 Because the heating element is located underneath the floatation device, it’s good for creating a larger vent in the ice. If you want a de-icer that doesn’t look like a de-icer, then this is for you. It’s a fairly standard floating pond heater with a 0° thermostat. The main draw, as you can see from the picture, is that it looks like a stone. They key here is maintenance! Keep it out of the pond as soon as it starts to warm up. It’s good even in larger ponds but it’s important that it’s taken care of properly. It takes 300 watts to power (so is towards the lower end of the spectrum) and can heat water to -20°F. Let me know your thoughts! Leave a comment below! I had the Laguna for 5 seasons. The last season the seal around the edge deteriorated and it was tipped almost full of water. I tried to repair with aquarium safe silicone and that worked for 1 season. I was concerned about water and electricty and as luck would have it, it stopped working. I never had to do any cleaning/maintenance mid season. I replaced with Farm innovators and after less than 2 months it stopped working. Problem was sensors had build-up with a little calcium but mostly just soft gunk. Quite disappointed in this de-iced mainly for that reason and there is no “ON” indicator light. It is annoying and inconvenient to have to keep a close eye on this when our winters are so long. My aeration keeps the ice open when the temps are severe. Thanks so much for sharing your experience Glennie. Did you ever consider cleaning with vinegar during off-season to prevent the buildup of calcium? And yep, the on/off light can be an issue. I have a 150 gallon Rubbermaid stock tank with just a few goldfish in it. I just set it up this year. It’s not exactly plastic, I think maybe styrofoam and ? Anyway it is very windy here. I have river rock on the bottom. I have the K&H 250w in my amazon cart but I’m wondering if I could place it on the bottom since I have the river rock? Also, could it ever burn the fish? This is my first time trying to keep fish outside for the winter and I’m a little nervous about it. Hi Carla. I can’t imagine there would be any problem with the river rock. And there’s little chance of it burning the fish…it only heats the water to a few degrees above freezing. Why not go with one that floats on the water if you’re worried? You can keep a closer eye on it then. Hey Luke. 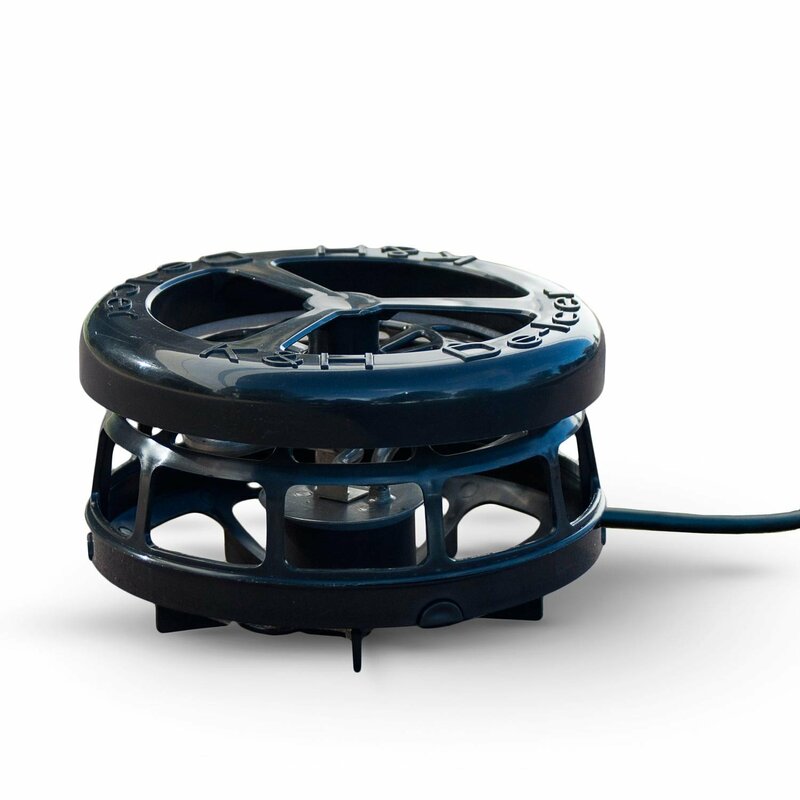 As the purpose of the pond heater would be to prevent the pond from completely icing over by maintaining a small hole in the surface, I don’t think it matters too much. Perhaps you could use more than one?